Introduction to the Strategic Plan The global network that Friendship Force is today looked very different over 40 years ago. In a time before computers, before the internet, and before travel became so mainstream, Friendship Force existed to dispel misconceptions about cultures, eradicate prejudices, and foster a sense of peace and friendship through experiences where understanding could be shared. Few could see the enormous vision that founder Wayne Smith and supporters Jimmy and Rosalynn Carter had for this concept, but over time, hundreds of members became thousands, and the few countries where exchanges took place grew to over 60! Not unlike the world in the late 1970s where limited cultural understanding existed in a vacuum of interconnectedness, globalization in the modern age of technology has created new cultural divisions where misunderstanding can fester into bigotry and even hate. Friendship Forceâ&#x20AC;&#x2122;s mission of promoting global understanding across the barriers that separate people could not be more important today. This strategic plan outlines the important focus of the International Board of Directors, the FFI world headquarters in Atlanta, Georgia, USA, and the 350+ clubs worldwide. Only when these three distinct, but deeply connected, groups come together collaboratively can FFIâ&#x20AC;&#x2122;s mission of enhancing cultural understanding prosper. Recognizing this is what led to the organization of this strategic plan. The International Board of Directors (BOD) 1. Partnerships & Support A key responsibility of the International Board of Directors is to help the organization access individuals, companies, networks, and foundations who may help support the ongoing development of Friendship Force International programs. Board members must also have the ability to represent the organization publicly by speaking at Friendship Force events or with the media, helping raise awareness for the mission. 1. Build International Advisory Council (IAC) Raise the profile of Friendship Force by partnering with well-known advocates of peace and citizen diplomacy. 2. Inspire giving from membership and external partners Inspire a culture of giving by leading the organization in annual giving and in special fundraising events. 3. Build endowment to support future growth A longer-term goal of the Board should be to work toward larger one-time gifts to build a sustaining endowment of the organization that would ensure the organizationâ&#x20AC;&#x2122;s future. 4. Ensure investments made by FFI connect with the strategic plan and support our mission Every dollar invested by our members through annual membership dues and participation in Journeys should go to advancing the mission of the organization as scripted throughout the strategic plan. 3. Governance Federal regulations require that all 501(c)3 designated nonprofit organizations in the United States have a Board of Directors in place to oversee the organization. Governance, though, goes beyond compliance. For the mission, governance means equal and fair evaluation of the policies that make Friendship Force work and ensuring that as an organization FFI adheres to the highest ethical standards possible. 1. Ensure the Board represents the diversity of constituents both within FFIâ&#x20AC;&#x2122;s existing membership and through prospective members. It is important that the makeup of the Board is diverse and reflective of the constituency FFI seeks to reach. This diversity goes beyond seeking skills related to critical areas such as finance, operations, and marketing, but also in the regions, cultures and people where FFI operates. 2. Improve bylaws and policy as needed Consistently review existing Board and club policy to support efficiency in program development and administration. 3. 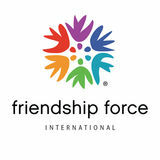 Evaluation of Friendship Force International Evaluate the Board, CEO, and clubs by formally assessing the efficiency and effectiveness of overall performance. Headquarters 1. Optimize Resources Continue to improve upon the tools needed for club development and member support. The resources that comprise headquarters include staffing, allocation of funding, utilization of partnerships, technology, and more. A key responsibility of headquarters is to allocate these limited resources as effectively and efficiently as possible to support the mission. 1. Provide member recruitment materials to clubs in multiple languages Supporting clubs in their member recruitment efforts is a core function of FFI HQ, starting with basic marketing materials that communicate our mission available in multiple languages. 2. Equip clubs with training and tools to promote our mission Clubs have been refining the best methods for hosting, traveling, recruiting, and supporting each other for over 40 years. HQ has a responsibility to make these best practices available to all clubs and in multiple languages whenever possible. 3. Create globally secure online access to member resources and information Modern technology gives FFI clubs the ability to complete many tasks associated with Journeys with ease and efficiency, from completeing ambassador applications to sharing information securely between clubs. 4. Build international banking network to improve the member experience FFI helps transact financials in support of our mission among members in 63 countries. With advancements in modern banking, opportunities exist to help members transact business more easily with a lower risk of exposure to currency fluctuations. 3. Create pathways for individuals, couples, and families to experience Friendship Force Regardless of age or location, FFI wants to invite all people to experience the power of peace through friendship and connect with our movement. Using technology to offer special Journey opportunities and personalized marketing, FFI hopes to engage a broad audience in our mission. organization they care most about. 1. Develop new communication channels to reach our clubs and members Embrace technology and methodologies that ensure the broadest communication reach to our members with critical information on club development, Journeys, and news from headquarters. 2. Improve skills and proficiency of club media relations Drawing attention to the important work of citizen diplomacy in action requires knowing who to talk to and how to convey the message of our mission to the media. Training clubs in public relations and social media magnifies the efforts of FFI HQ in raising global awareness towards our work of promoting global understanding between people. 3. Educate the public on work of FFI and our mission of citizen diplomacy By utilizing various distribution services, promote FFI through production and publication of at least four unique pieces each year in strategic markets and media outlets. 4. Expand online tools to improve member communications among each other and headquarters. Create a secure online member profile sharing tool that strengthens connections before and after Journey experiences. 5. Gather Support Endorsements from public leaders, celebrities, and people of influence give FFI the credibility to open new doors to funding and support. Support, whether financial or programmatic, will fortify the organizationâ&#x20AC;&#x2122;s ability to make an impact in the years to come. 1. Identify and build relationships with organizations that can help fulfill our mission Build or join a consortium of like-minded organizations in order to collaborate and amplify our mission. The nonprofit community has many organizations that work toward the same mission as FFI and/or address issues that can easily coordinate with our programs. 2. Allocate annual donations to advance important projects Give members the opportunity to contribute to projects and initiatives that strengthen FFIâ&#x20AC;&#x2122;s core programs, helping to support new club development, developing Journeys, and offering scholarships to clubs and members in need. 3. Provide exemplary financial information to members and donors The annual report will include all information about FFIâ&#x20AC;&#x2122;s current financial state so that members and potential donors are assured that their donations are being used properly. FFI is also committed to providing additional information as needed to show where and how funds are being used throughout the organization. 4. Identify external funding sources Seek grants and financial support to enhance existing programs and to pilot new ones. A plan is only as effective as the action we put behind it! Outlined in the club section are important focus areas to strengthen clubs, fill Journeys, attract members, and promote the mission of peace through friendship locally. To participate, discuss these options with your club and decide which actions you want to work towards. Set a goal for when you want to complete the action, and then tell us how it went! Throughout the duration of this strategic plan, FFI will look for your examples of success to celebrate your clubâ&#x20AC;&#x2122;s achievements with other clubs around the world. HAVE FUN! FAQ What if we need help, where can we go? Embedded in the Member Resources are links and information related to each of these areas. This is a great place to begin. Additionally, you may reach out to your local Field Representative as well as your Regional Support Manager at FFI HQ. Can we come up with our own actionable activity related to one of the areas outlined? Absolutely! Many clubs have ideas they have been working on that they are ready to implement or explore further. Just tell us what itâ&#x20AC;&#x2122;s about when you submit your results we would love to share this with others. How will clubs submit reports on their accomplishments? Reports can be submitted to your Regional Support Manager, or by completing the online form found in Member Resources created specifically to submit your progress. 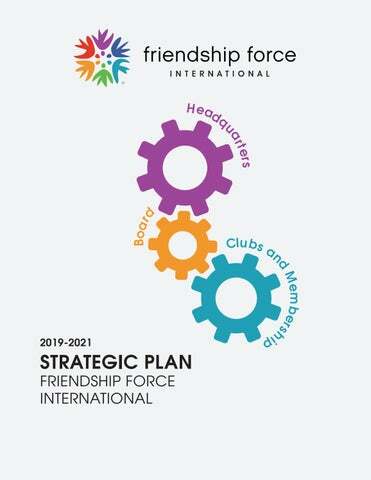 Here is Friendship Force International's 2019-2021 Strategic Plan.